Between Dropbox, Google Drive, OneDrive and a half dozen other services, the sky’s the limit on how much cloud storage you can get. Here are some of the best ways to get extra free space on each service. Every cloud storage provider has a variety of changing promos that can give you extra storage space, so it’s always worthwhile to keep an ear to the ground. Some of the promotions we mention here may change over time, but they’ll also likely be replaced by something else. Cloud storage providers seem to like giving away space like candy if it means new customers. Invite a Friend (Up to 16GB): The most common way to get extra storage is to refer a friend. Every person you get to sign up adds 500MB of space to your account. You can get up to 16GB of space with this method, though Dropbox is ubiquitous enough that you probably won’t have much like finding 32 friends that haven’t signed up for Dropbox. Still, it’s worth a shot. Complete the “Get Started” Guide (250MB): Dropbox has a “Getting Started” guide that will show you the ropes. Most of it is routine stuff you’ll probably do anyway, but if you do all the steps, you’ll add a bit of extra space for nothing. Install Carousel (3GB): Dropbox used to have a bonus for enabling auto upload for your photos. While that promo has been deprecated, you can still get 3GB by installing the Carousel app for Android or iOS. Install Mailbox for iOS (1GB): Dropbox has a similar promotion for its Mailbox app. Unfortunately, this one is only available for iOS, however logging in once gives you the space permanently. So it may be worth a quick trip to the Apple store. Just be sure to deauthenticate the device if you use this trick. Link your Facebook or Twitter accounts (125MB each): Pandering on social networks for extra space is a little taboo, but you can still eek out a little extra space by connecting your accounts. Though you may be asked to invite other users on the social sites. Watch for device bonuses (Lots of GB): If you’re in the market for a new device, you may keep an eye out for promotional offers. While they’re not always available, Dropbox has offered up to 48GB of space for two years when you log in on a new Samsung or HTC phone. These offers pop up now and then on phones and tablets, so ask about them the next time you’re out shopping. 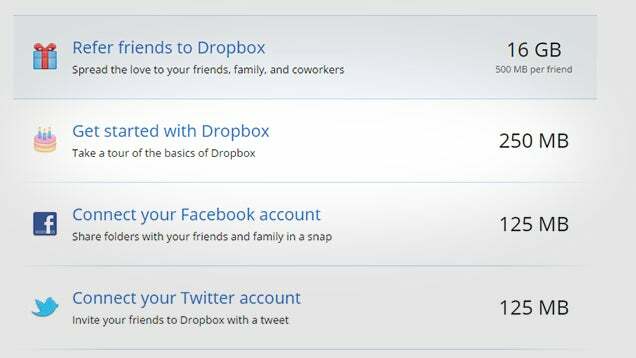 You can also check Dropbox’s Get More Space page here to find any other tasks you can complete to earn more space. There is also a link here to check your personal account settings to see which space you’ve already earned and which ones you can still complete. 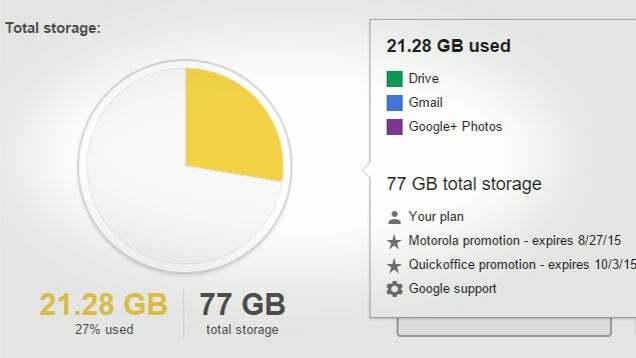 Google’s competing cloud storage has a bit of home field advantage. Google was already home to a lot of your data before it ever started syncing folders on your desktop. While the company offers some promos that can give you extra space beyond the default 15GB, there are a lot more tricks that you can use to upload data that doesn’t count against your storage limit. Use Play Music to store audio: Play Music is Google’s storage locker for your music. The company recently bumped its storage limit up to 50,000 tracks, all of which do not count towards your storage limit. Convert your documents to Google Drive format: If you’re using Drive to store your documents, converting them to Google’s formats will prevent them from counting towards your storage limit. As the How-To Geek points out, you can automatically convert documents you upload to Google Docs while uploading to make the process easier. Crop photos below 2048×2048: Google allows you to upload an unlimited number of photos, provided the resolution of those pictures is below 2048×2048. A similar rule applies to video below 15 minutes. You can check your storage settings here to see how much space you have free, how much comes from promotions, and which types of data are taking up space. If you fill up too much, you can delete or convert some of your files to make room. Google also offers similar promotions to Dropbox when you purchase certain devices, or complete tasks like the Security Checkup promo they ran last month. Be sure to keep an ear out for these. Box offers 10GB of free storage with its basic plan. Like all of the others, you can pad that out with certain promotions—usually by installing the Box app on a specific phone or tablet. Unlike the others, Box has a handy page here that will tell you all the devices that will currently net you extra space. 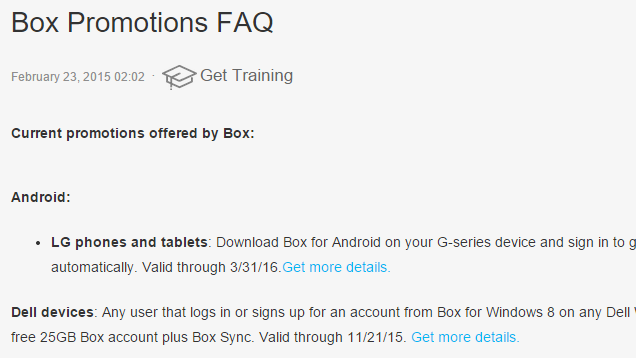 Unfortunately, Box doesn’t offer any bonuses for referrals, but keep an eye out for install-our-app promotions. 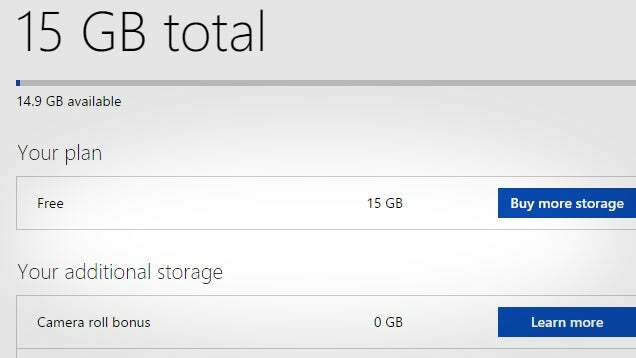 Link your Office 365 Subscription (1TB): While this technically isn’t a free option, if you have to use an Office 365 subscription for work, school, or personal use, you’re eligible for 1TB of extra space in your OneDrive account. Notably, Office 365 Home includes 1TB for up to five users, so if a friend or family member has the group plan, it may be worth asking if you can join up to get the space. Refer a friend (Up to 5GB): Like Dropbox, you can refer other users to OneDrive to get 500MB for each person you sign up. This bonus is limited to 5GB, but it might be easier to find people who haven’t yet activated a OneDrive account than it is to find someone who’s new to Dropbox. Backup Photos with Camera Roll (3GB): The OneDrive app for Android, iOS, and Windows Phone can automatically backup your pictures to the service. If you enable this, you get 3GB of space for free. You can disable it after that, if you don’t want to actually backup your photos, and the space will stay. OneDrive has become a formidable competitor to Dropbox, not the least of which because it’s integrated directly into the most-used desktop operating system in the world. You can’t get a ton of space without paying for it, but every little bit helps. If you’ve tried everything else on the list and still need more space, you can pad out your storage with BitTorrent Sync. The service just launched its 2.0 software, which allows you to sync up to 10 folders between devices with no storage limit at all. While the folder workaround is a little obnoxious, you can easily use this to sync your largest files, while leaving services like Dropbox to handle the rest. Of course, BitTorrent Sync doesn’t keep copies of your files on any servers, so you can’t use it as a backup like you can with Dropbox, Google Drive, or OneDrive. If your devices get destroyed, your files are gone. But it’s still better than nothing. MEGA: Formerly MegaUpload, Mega offers 50GB of free space. The company emphasizes security and promises end-to-end encryption, though as we’ve discussed, their encryption may not be bulletproof. Wuala: Another security-focused cloud storage provider, Wuala offers 5GB of space for free. Not only does it offer end-to-end encryption, but it also breaks your files into segments and stores them on different servers, so even the company itself can’t know which data belongs to what. Even if you don’t do anything to earn bonus space, the most basic plans from the services we’ve listed in this article combined would give you over 100GB of storage without lifting a finger. However, you can raise that number by quite a bit with minimal amounts of effort. How to Avoid Mobile Ranking Pitfalls by Assessing Mobile Engagement 8 reasons why your business NEEDS a professional website!